Over the last dozen years, the number of black firefighters has dropped by a quarter in the Boston Fire Department. Inside the Grove Hall firehouse, a group of job seekers got a crash course on landing a coveted job with the Boston Fire Department. They tried on a heavy fire suit, learned how to work an air mask, and were introduced to civil service hiring. But in the end, mastering those skills would matter little. That is because most in the largely black and Latino group lacked one near-mandatory item on their résumés: military service, a qualification more commonly met by white applicants than minorities. The preference given to veterans is thwarting the hiring of minority firefighters, even as the number of African-Americans in the Fire Department plummets — down by a quarter over the past dozen years. Massachusetts has one of the strongest veterans preference programs in the country, a preference courts have upheld. “An individual who is not a veteran has a very small chance of getting on the Fire Department,’’ City Councilor Tito Jackson of Roxbury said. As the Boston Fire Department prepares to select its first diversity officer, that message has emerged front and center. The appointment, expected soon, is putting a spotlight on the makeup of an agency that has become less racially and ethnically diverse in recent years — and remains one of the best-paid fire forces in the country. Fire Commissioner Joseph E. Finn said he is committed to bringing more blacks and Latinos into the department but must operate within the constraints of state law, which gives hiring preference to veterans, and also federal law, which protects service members’ employment rights. Since 2013, the department has hired 158 veterans but only two firefighters who did not serve in the military. Finn said he has interviewed one candidate for the diversity chief post, but is casting a wider net before making a decision. He said he wants the diversity officer to be passionate about seeking veterans of color and spreading the word to high school students to first join the military before seeking a spot with the Fire Department. A Boston Fire Department recruiting event at the Grove Hall Fire Station in 2014. A dozen years have passed since a court ended a consent decree that for nearly three decades forced the Fire Department to diversify. 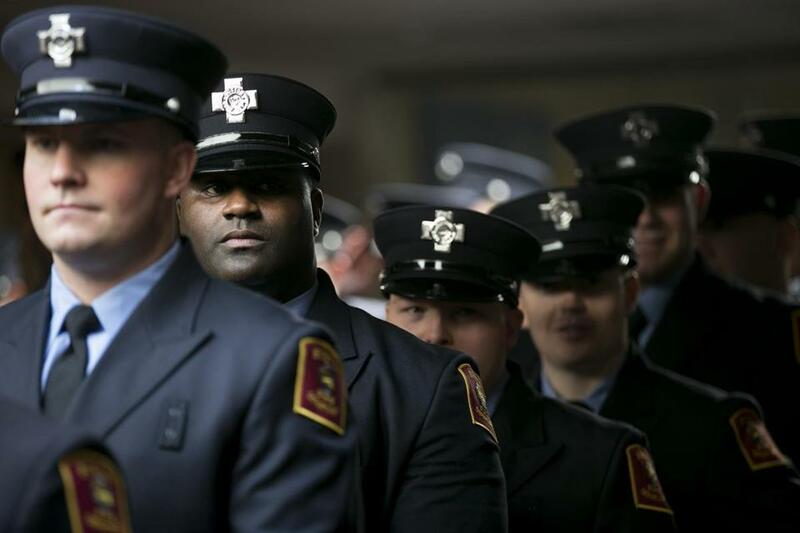 But since then, 80 percent of the department’s hires have been white, according to figures from the Boston Society of Vulcans, a group of black firefighters that advocates for diversity. The Vulcans and other advocates say the department’s diversity gains have dwindled in part because of uneven enforcement of residency rules, a resistance to changing state law, and the unintended consequences of the civil service veterans preference. That preference, they say, aims to help one vulnerable group at the expense of another. Since the consent decree ended in 2003, the ranks of black firefighters has declined by 25 percent, from 420 to 315. The number of Hispanics has hovered near or slightly above 100 over that 12-year period, while the department has just three Asian firefighters. Whites compose 72 percent of the department’s 1,480 firefighters, blacks 21 percent, and Hispanics 7 percent, making it one of the city’s least diverse departments, according to a new report from the administration of Mayor Martin J. Walsh. ‘When you have absolute preference, you leave no opportunities for these kids . . . they should be given an opportunity to join’ the Fire Department. But advocates for veterans defend the hiring preference. “We as a society owe our veterans our gratitude for their sacrifice,’’ he said. Darnell Williams, president of the Urban League of Eastern Massachusetts, said it’s not enough to recruit more potential African-American and Hispanic candidates unless the hiring system is overhauled. 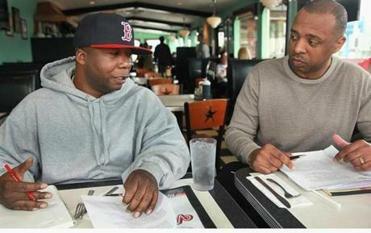 “The system is flawed,’’ said Fire Captain Rayshawn Johnson (left), president of the Boston Society of Vulcans. Finn, a former Marine, stressed that he is not interested in building a list of minorities who won’t have a chance at a Fire Department job. Instead, he wants the agency to sharpen its recruiting, seeking applicants from communities of color who served in the military. As she visits high schools, radio stations, and community meetings, Fire Department recruiter Michelle McCourt extols the benefits of serving on the force — robust pay, camaraderie. But she also is frank about what it really takes to join the department. That is not well known in many minority communities, where civil service applicants still believe a high test score increases their chances for a fire job. Using state law, the department first selects survivors of firefighters killed in duty, followed by disabled veterans, and then veterans who are not disabled. In recent years the selection seldom reaches people who did not serve in the military. Johnson, the Vulcans president, said young men and women from neighborhoods such as Roxbury and Mattapan — where unemployment remains mired in double digits — also deserve a chance to serve on their local fire force. “When you have absolute preference, you leave no opportunities for these kids,’’ Johnson said. “Some kids don’t want to join the military. But they should be given an opportunity to join” the Fire Department. Some diversity advocates, while hailing a preference as crucial for veterans, lament another barriers to department diversity. They note anecdotal cases of job applicants moving to Boston, achieving residency, and being hired first. Applicants who are not veterans and who seek to join the department must have lived in the city for at least a year prior to taking the civil service test. But Massachusetts veterans who are being discharged have 90 days to establish residency in the city or town they want to work in. The issue came up last year when the City Council passed an ordinance pushed by Councilor Michael F. Flaherty to extend the residency requirement to three years for fire and police jobs. The measure would not affect the veterans preference. The mayor then vetoed the measure, pledging to bring the matter to the Legislature for consideration.